Here is a chart summarizing the cash I received this month from my stocks. The dividends received this month marks a new high for me. It is extremely gratifying seeing my monthly income stream grow after my monthly contributions. It is also very satisfying seeing my companies raise their dividends at an average rate of 10%. 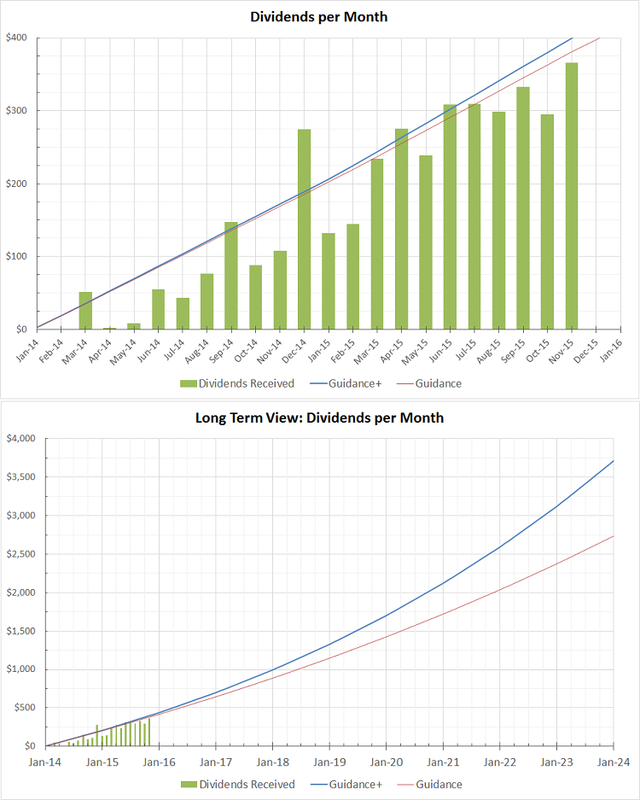 Here is a plot showing my dividend progress so far, and some target goals I have set myself for the coming years. So far I am relatively on track. No dividends cuts have been experienced so far this year. My investments in the coming weeks will be slower since I will be celebrating Christmas and buying gifts. Happy holidays. Great job Young Dividend! Looks like you're on pace for your monthly dividends which is good. Once your dividend payments get even larger those increases will be much more significant. Keep up the good work!